Don’t misinterpret it: I’m all for counting your calories, but I am against taking it too seriously. We act as if we have to hit our exact caloric goal every single day in order to see results. And what happens when we overeat? We stress about it, get upset with ourselves, and feel the need to eat less the next day. I walk my dog every single day. I don’t necessarily count my steps or my distances, but I monitor it from time to time. Some days we’ll walk 5 miles total. On other days when the weather is crappy, we might walk just over 1 mile. Let’s estimate and say I burn 80 calories per mile walked. On a rainy day where I don’t walk as much, I’m burning over 200 calories less than I usually do! But do I eat 200 less calories to compensate? Nope. On the flip side, let’s say you are trying to eat 2200 calories every day to maintain your weight. You track everything, and realize at the end of the day, you ate 2400 calories. 200 calories extra! And this makes you feel awful. Look at the big picture. One day will never make or break you. 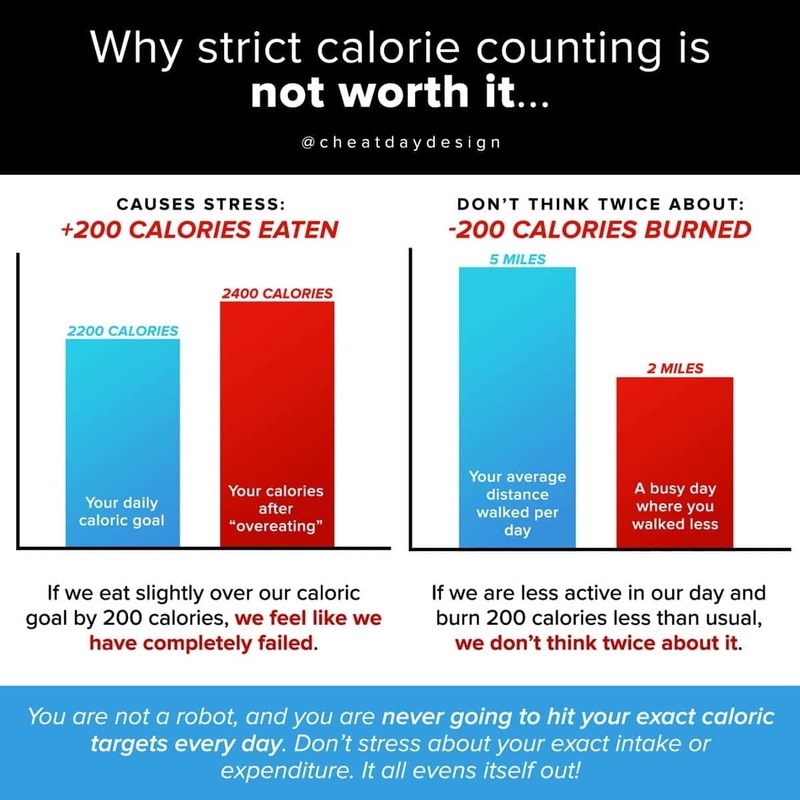 We stress so much about our exact calories, but there are so many variables that affect that number. If you’re on your feet all day, you’ll burn more calories. On a super busy day at work, you might be stuck at your desk all day and not move much at all, burning less calories. Likewise, your consumption is going to vary each day, too. Use your calories as a guide, but remember that nothing is exactly the same from day to day. 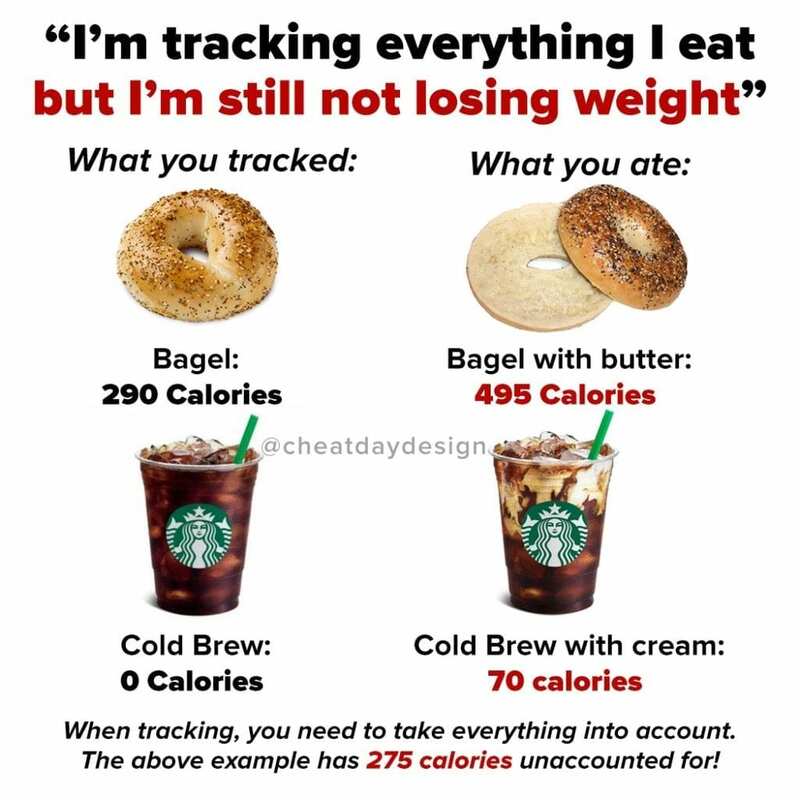 Don’t stress if your calories are off!